Seepage is composed of thousands of flattened aluminum wrappers from Nigerian liquor bottle caps that the artist El Anatsui and his team of assistants tied together with twisted strands of copper wire. Its shimmering metal surface resembles a mosaic while its undulating form suggests a regal tapestry. The bold coloration and pattern also suggests traditional Kente textiles that are made by male weavers and traditionally used for religious and ceremonial occasions in Ghana, where Anatsui is from. Since 2002, Anatsui has been making these bottle-cap reliefs as a way of addressing the legacy of colonialism in Africa and the historic triangle trade, in which European countries imported alcohol into Africa in exchange for slaves, ivory, and gold. Seepage reminds us of the way that African people were treated as commodities or currency. This is one of very few double-sided bottle-cap works that Anatsui has ever made and the only one in a museum collection. This is the first time the Blanton has exhibited the red side of the relief. 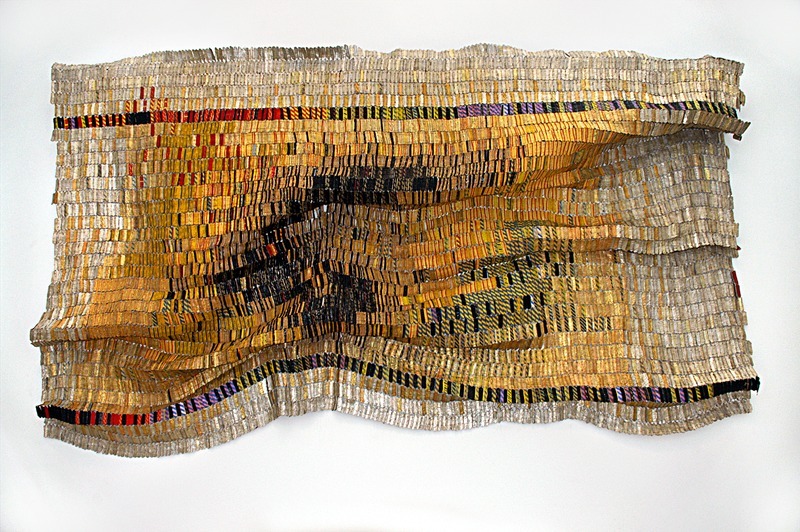 El Anatsui, “Seepage,” Blanton Museum of Art Collections, accessed April 26, 2019, http://utw10658.utweb.utexas.edu/items/show/2913.